This program provides you with the perfect evaluation process, tools and best practices that make the evaluation process simple upon application. You will also learn the basics of the evaluation, how to design it, develop it and implement it, and how to evaluate it, analyze it and extract its results. This program is prepared for all trainers, designers, training designers, performance consultants and all the trainers who want to assess training effectiveness. Determine who takes responsibility for training evaluation. Use more than twenty lists to help in training evaluation. Push the administration to participate in taking responsibility for the evaluation. Use twelve forms to help in training evaluation. Verify the statements’ validity and accuracy. Determine the base performance and the expected performance. Write the evaluation’s objective, with its main components. Use guidelines to create an evaluation related to the group learning. Design methods for evaluating the results or the return on investment. Design methods for the application evaluation. Design methods for the learning evaluation. Design methods for the reaction evaluation. Determine the tangible and intangible evidence of the employee’s improved performance and its impact on the institution. Test the performance level measurement and the prior and final knowledge level measurement. Analyze the tangible and intangible evaluation statements. Isolate variations from the rest of the variations. Distinguish the available training evaluation options. Write a detailed evaluation report convincingly. 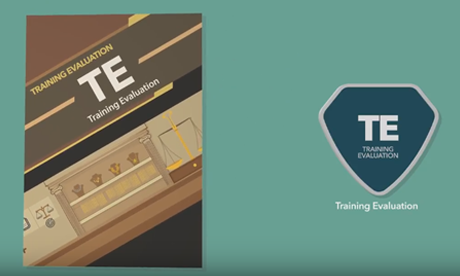 Distinguish the trainer’s total responsibilities in addition to the training evaluation. Who is responsible for the training evaluation. More than twenty lists that help in training evaluation. Six guidelines addressed to you during the tests’ evaluation. Twelve forms that help you in training evaluation. How to verify the statements’ validity and accuracy. How to determine the base performance and the expected performance. The essential components of the evaluation’s objective. More than 25 techniques for evaluation. Seven guidelines to create an evaluation related to the group learning. How to design means to evaluate the return on investment. The tangible and intangible evidence of the employee’s improved performance and its impact on the institution. Method to survey influence, climate memos and critical incidents. How to design the application evaluation means. Nine techniques in the application evaluation. How to design the learning evaluation means. Factors that affect the evaluation process during training. Testing the performance level measurement and the prior and final knowledge level measurement. How to design the reaction evaluation means. How to choose the evaluation means corresponding to the situation. How to perform evaluation via the Internet. What are the alternative means for reaction evaluation. Ten important tips for the evaluation documentation. Where to do the process of statement collection and how. Nine necessary basics when you need a staff evaluation. The necessary items when evaluating the course by the trainees. Eleven items you need when evaluating the training materials. Six necessary items when performing a practical test for the course. How to analyze the tangible and intangible evaluation statements. Methods to isolate variations from the rest of the variations. How to calculate the return on investment. How to analyze the application statements. How to analyze the learning statements. How to analyze the reaction statement. Options to evaluate training and fix it. The essential contents of the evaluation report. How to write a detailed evaluation report convincingly. The trainer’s total responsibilities in addition to the training evaluation.